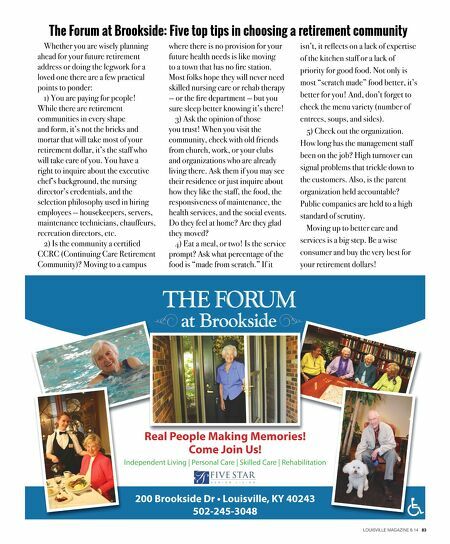 82 LOUISVILLE MAGAZINE 8.14 Special Advertising Section www.episcopalchurchhome.org www.episcopalchurchhome.org Welcome home to all- inclusive amenities and services at Oxmoor Lodge and Ponder Creek The joy of an all-inclusive lifestyle is writing just one check a month and having life's daily details taken care of for you. At Oxmoor Lodge, choose from comfortable apartments in a variety of sizes and foor plans or beautiful cottages that combine all the pleasures of a stand-alone home with the many benefts of community living. Each cottage Enjoy your own private suite and the freedom to furnish it. features a full kitchen with most major appliances, private yard or patio, washer and dryer, garage or convenient parking and more. 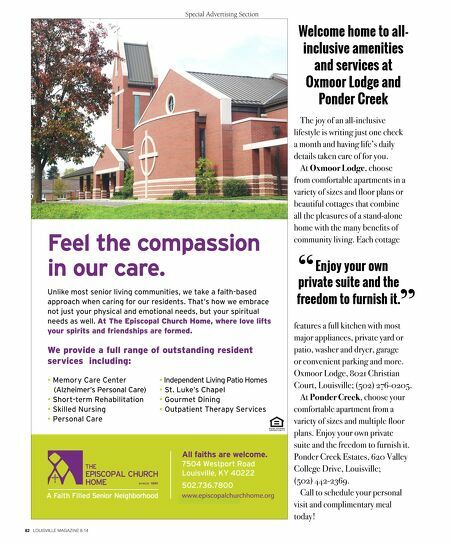 Oxmoor Lodge, 8021 Christian Court, Louisville; (502) 276-0205. At Ponder Creek, choose your comfortable apartment from a variety of sizes and multiple foor plans. Enjoy your own private suite and the freedom to furnish it. Ponder Creek Estates, 620 Valley College Drive, Louisville; (502) 442-2369. Call to schedule your personal visit and complimentary meal today! " "